Extending Mendes’ observations, this post is an inquiry into »drawing and the brain« when there is not one brain, but two. The drawings presented here were done by the artist Simone Rueß when she was pregnant with her second son, Milan (born August, 2016). As the images attest, and as the below comments by Rueß imply, drawing while pregnant is a complex process constituted by an interplay or an intertwining of nervous systems. Thinking about Rueß’s work thus raises a larger question regarding who or what is drawing when a pregnant woman draws. This question goes beyond the mind/body binary of an individual and moves into the terrain of drawing as a multi-person endeavor. Such an endeavor is not static: the feedback loops between the fetal nervous system and the nervous system of a pregnant woman change dramatically during the gestation period. Figure 1 was drawn at twenty-eight weeks into Rueß’s pregnancy. my senses are in this moment directed to the inside of my body and things happening around are deactivated. An earlier drawing (Figure 2) displays a freer hand. Here, Rueß imagines the »possible movements« of the fetus at an early period of gestation (twenty-third week). The remarkable drawing below (Figure 3) was produced at approximately the same time as Figure 2. We cannot help but see Rueß listening with her entire body – the paper seems to shimmer and ripple across its surface. right now in this moment I reacted by drawing, as the little one reacted to me and my breathing. — communication between me and the little by breathing to it. The sense of a new presence seems to have generated a proliferation of perspectives – a flurry of reaction through drawing (see Figure 4). I can feel that these movements are dependent on this very specific space in the uterus. and of course I am aware of the very special sonic space the little one inhabits. But instead of hearing it through my ears, I feel it. So I think even that something of this acoustic world is transported to me, but through the movements. I have very much the impression that the little one experiences things from outside through my emotions. In Rueß’s drawings, one witnesses the inscriptions of a conglomerate body – of a »body« that is more than one and less than two. Rueß translates what she experiences into an image, but the very act of drawing is registered by the fetus which then »responds« in turn. The fetus is therefore both the object of the drawing and an active participant in its creation. can you see there parts of what I am telling you? Please ask and write me, if this doesn’t make sense to you. Her doubts are reasonable, and not only because I am a man and therefore will not – cannot – ever understand the experience of pregnancy. Her doubts are reasonable because there is hardly any precedent for thinking about authorship, creativity, or knowledge production in this way. Indeed, Rueß’s practice is not reducible to ready-made theories, such as Barthes’ »death of the author« or Deleuze’s conceptualization of the author as an assemblage or »machine.« Instead, her work explores what I would call the pregnant subject – a subject that is teeming, charged, full, or even bursting. Pregnant subjectivity is a subjectivity of excess: a more-than-one subject (which nevertheless is not quite two). So who, to repeat the question, draws these pictures? It’s a bit of a stretch, but I sometimes like to imagine these drawings as self-portraits – as if the fetus, through its movements and its expressions, is »forcing the hand« of the artist. Because even if not consciously or with direct intention, the fetus does indeed play a part in its own visual renderings, in its own graphite-etched contours. When Rueß read this paragraph in an earlier version of the paper, she was immediately reminded of two drawings she did on July 10th. 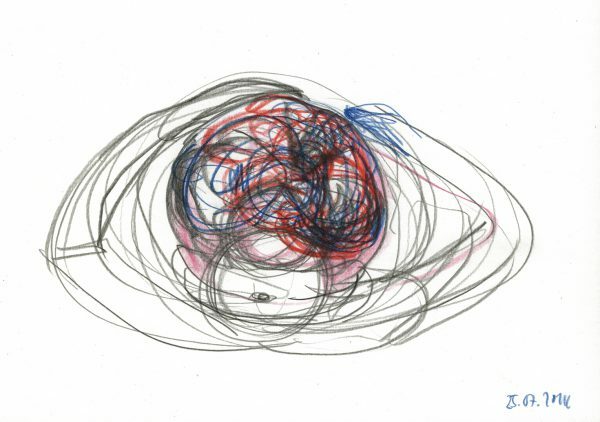 Rueß suggested that I include the drawings here (they are below [Figures 6 and 7]), and I think I can see why: it is almost as though the drawing is an automatic transcription of the fetus’ movements, as though the artist’s hand is simply tracing the oscillations that the fetus is radiating outwards. Figure 7, finally, represents not the movements of the fetus per se, but rather its »movement space«, or its space of possible movements. Here again, the artist does not simply impose her subjective artistic expression onto inert matter. She draws as a more-than-one. Rueß’s work forces us to reconsider authorship, and it also compels us to reimagine drawing as a feminist practice of co-constitution. In addition to affirming the insight that knowledge is always of and in the body, the drawings presented in this post challenge the sovereignty of the individual. The question, »Who drew this?« no longer has an obvious answer. These drawings produce equivocations about embodiment, authorship, and even artistic labor. If a consideration of the fetus threatened the entire edifice of Cartesian philosophy, it is equally true that today fetal personhood challenges political ideologies on both the Right and Left. For, while the mere mention of fetal personhood risks becoming fodder for anti-choice propagandists, pro-choice activists should not feel emotionally blackmailed into accepting a narrow definition of individualism. To this end, feminists have advocated »recuperating the fetus« by recognizing its ubiquity in the public landscape and exploring »the practices, institutions and discourses that have brought fetuses into the center of reproductive politics.«  Simply ignoring the fetus does not a politics make. There is no contradiction between supporting the free choices of adult women and honoring the deep connections – contingent, of course, and always culturally situated – that pregnant women establish with their fetuses over many months. What this post ultimately shows is that it is perhaps not enough to challenge the Cartesian mind/body binary, that perhaps it is not enough to simply fold the mind into the body in order to affirm that knowledge is always embodied. Why? Because this critique of orthodox Cartesianism runs the risk of valorizing the individual human body as the sovereign site from which knowledge is produced. What is needed, then, is a radical expansion of the notion of personhood – of how we describe who or what is drawing, beyond any consideration of body and mind. Simone Rueß is an artist, and her work does not provide any clear-cut answers to questions about drawing, neuroscience, authorship, or personhood. But it does offer a compelling reason for why such questions still need to be asked. Between mind and hand, one could say, lies a massive and largely uncharted territory of mediation – especially if the drawer is a woman-fetus, certainly more than a single person and certainly less than two. How very mysterious it is when this »more-than-one« is channeled into the sharp, cool tip of a graphite pencil. Gavin Steingo would like to thank Simone Rueß for opening her life and her work for this project. He would also to thank Matthias Reinhold, and to Leon and Milan Ganoa, for their continued generosity and kindness. Simone Rueß would like to thank Gavin Steingo for sharing his research for this project. Jump Up This is according to Kaja Silverman’s excellent rendering. See her, The Acoustic Mirror: The Female Voice in Psychoanalysis and Cinema, Bloomington, IN: Indiana University Press, 1988, 102. See also Kristeva, »Motherhood According to Giovanni Bellini,« in Desire in Language: A Semiotic Approach to Literature and Art, edited by Leon S. Roadiez, New York: Columbia University Press, 1980. Jump Up I borrow the expression, suggested to me by Jairo Moreno, from Marisol de la Cadena’s rendering of Marilyn Strathern’s »partial connection,« »a relationship composing an aggregate that is ‘neither singular or plural…a circuit of connections rather than joint parts’.« See de la Cadena »Indigenous Cosmopolitics in the Andes: Conceptual Reflections beyond ‘Politics’« Cultural Anthropology 25.2, 2010: 334-370, 347; Strathern, Partial Connections, New York: AltiMira, 2004, 54. There is a long and vast history of theorizing the pregnant woman /fetus relation, which I will largely pass over in this piece. For a review and elaboration of that literature, see Jairo Moreno and Gavin Steingo, »The Alluring Objecthood of the Heartbeat,« in Sound Objects, edited by Rey Chow and James Steintrager, forthcoming from Duke University Press. Jump Up Language to describe the fetus is also fraught. Rueß shifted terms through the duration of her pregnancy, from »it«, to »the little one«, and then to »Ganao« – a gibberish name invented and insisted upon by Leon, Rueß’s two-year old son. Jump Up »…suggestive, implying more than is obvious or stated« – so timidly states the mighty OED. Jump Up The exact quote is: »nothing can be in him, insofar as he is a thing that thinks, of which he is not conscious«, AT 9, 1: 167. The quote, as well as my argument about Descartes’ changing opinions, is from Rebecca Wilkin, »Descartes, Individuality, and the Fetal Subject,« differences: A Journal of Feminist Cultural Studies, 19.1, 2008: 96-127, 105. See also Veit Erlmann, »Descartes’ Resonant Subject, « differences 22.2-3, 2011: 10-30. Jump Up Wilkin, »Descartes, Individuality, and the Fetal Subject,« 109. Jump Up Meredith Michaels and Lynn Morgan, eds., »The Fetal Imperative, « Fetal Subjects, Feminist Positions, Philadelphia: University of Pennsylvania Press, 1999, 1-9, 2-5; as quoted in Wilkin, »Descartes, Individuality, and the Fetal Subject,« 99. Simone Rueß, born in 1982, observes the structures of cities and how citizens make use of the urban space. By inhabiting cities as Warsaw, Paris, or Berlin, she explores her own movement space, as well as those of others. After graduating from the Academy of Fine Arts in Stuttgart, Rueß came to Warsaw in 2008 for a DAAD postgraduate scholarship. 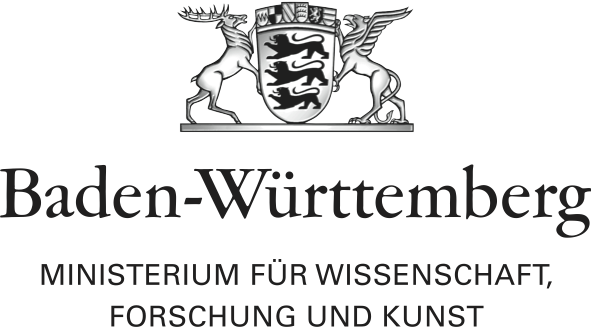 She has been granted various fellowships, amongst them the Arbeitsstipendium of Stiftung Kunstfonds Bonn and a stipend of Cité Internationale des Arts, in Paris. Gavin Steingo is a South African researcher, musician, and activist. He is the author of Kwaito’s Promise: Music and the Aesthetics of Freedom in South Africa (University of Chicago Press, 2016). Steingo currently teaches at Princeton University. What is the Impact of Drawing on the Brain?